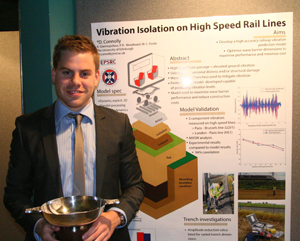 Congratulations to David Connolly, a postgraduate student in the Institute for Infrastructure and Environment, who has won the Scottish Geotechnical Group Poster Presentation Cup in December. Twelve selected poster presenters, which included geologists, construction professionals and academic presenters, were invited to present their work at the event. Each candidate gave a brief discussion on their poster, with informal questions from the judges, after which four people were chosen to progress to the final where they all gave a 10 minute presentation based on their posters followed by a 5 minute question and answer session. Judging was based upon the technical poster content, the ability of each speaker to communicate the content of their poster and the ability of each speaker to answer probing questions. After winning the competition, David was eligible to compete for funding to attend the European Young Geotechnical Engineers Conference 2013, in Paris. After entering, he was judged to be the best candidate and was selected to be the UK representative on behalf of the British Geological Society. The poster presentation was entitled: "Vibration isolation on high speed rail lines" co-authored by Professor Mike Forde. High speed rail transportation generates increased levels of ground borne vibration and air borne noise in comparison to traditional rail. Increased vibration levels are caused by train speed and carriage weight, and are the focus of this research. Vibrations can be problematic for both people and structures located near high speed train lines. Wave barriers are used to shield structures located near such lines from elevated vibration levels, but their installation is often expensive. This research uses a combination of numerical and experimental tests to demonstrate that by analysing trench dimensions it is possible to significantly reduce construction costs while maintaining high vibration protection. Firstly, experimental investigations are undertaken on a high speed rail line in Belgium to record the vibration levels generated during high speed train passage. Then a numerical model is developed capable of simulating ground vibration at the test site. The results from the mathematical model are compared to the experimental investigations and a strong correlation (94%) is found, indicating that the model is capable of predicting vibration levels with high accuracy. The model is then enhanced to investigate the ability of various wave barriers to shield structures from ground vibration. After a wide variety of simulations are performed it is found that wave barrier length and depth greatly affect trench performance whereas wave barrier width and distance from the track only have minor affects.